The Vegas Golden Knights Are Paying Marc-Andre Fleury How Much? The Golden Knights Are Paying Marc-Andre Fleury How Much? 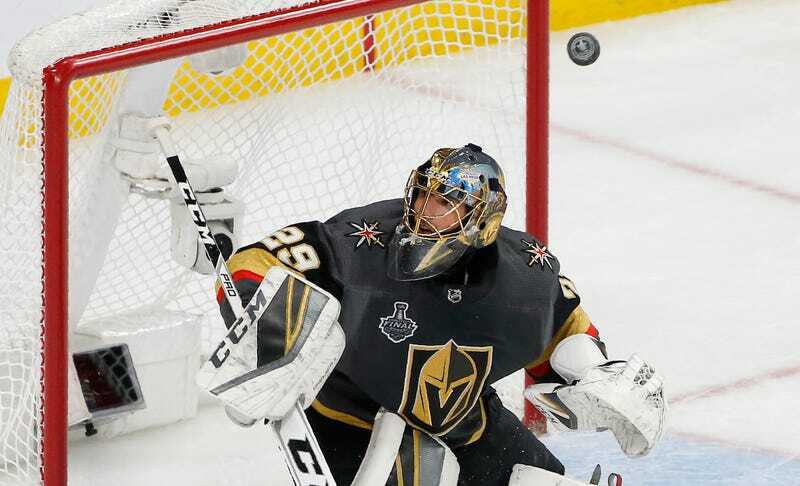 The Vegas Golden Knights announced that they have signed goaltender Marc-Andre Fleury to a very bad contract extension. The terms: Three years, $21 million, and it’ll kick in after next year and run through the 2021–22 season. Fleury looks pretty thrilled about it, and why wouldn’t he be? Look, we all love Marc-Andre Fleury. If I had $21 million I would pay him to be my friend. And he did play out of his mind last season and through three rounds of the playoffs, carrying the expansion Golden Knights all the way to the finals. But this is a tough one to figure. The Golden Knights are shelling out an entire year earlier than they have to—which means they weren’t bidding against anyone—and don’t appear to have gotten a discount. They’re also paying based on the best year of Fleury’s career. A $7 million AAV is market rate for a guy who plays like that every season, and the odds are very, very good that Fleury never does it again. Let alone when he’s 37 years old and still on this contract. This is, in fact, the fattest, richest per-year contract of Fleury’s life. The salary cap is going up to $80 million this year, and will go even higher over the length of this contract, so by the end of it, Fleury’s $7 million won’t be as big a chunk of the Knights’ cap as it looks right now. Fleury’s a legit star in Las Vegas, beloved by fans. This was the plan from the moment they acquired him, long before they even dreamed of being an actual good hockey team. If the Golden Knights regress to mediocre or worse—I may regret saying this, but they definitely will—we’ll find out exactly what kind of draw they can be. Having Fleury as the face of the team will help. Vegas has a ton of cap space to play with, with around $17 million in space for next season. They currently have less than $40 million in salary locked in for 2019–20, a figure that includes the first year of Fleury’s extension. GM George McPhee acquired a ton of picks in his expansion draft dealings, so stocking the roster should come relatively cheaply in the next few years. All of this is to say that if the Golden Knights have to eat $7 million for a backup goalie, they might be able to afford it without crippling the team completely. Again, these are mostly just me trying to talk myself into this deal making any sense for Vegas. It really, really doesn’t. Good for Fleury, though! Alex Ovechkin Really, Really Loves The Song "My Neck, My Back"